Entering the upper basin on the Stanley Glacier trail. One of Kootenay Park’s most popular half-day hikes, the 4.2-km Stanley Glacier trail (161), will be closed from Wednesday, July 16 to August 31 while the flood-damaged trailhead bridge over the Vermilion River is being replaced. Restrooms and the south half of the parking lot at the trailhead will be available for roadside day use during construction (see “Important Bulletins” on the Kootenay Park website). Following repairs to the Stanley Glacier bridge, the contractor is scheduled to move 6 km south to the Paint Pots trailhead (163), where another bridge over the Vermilion River was destroyed by last year’s flood. While it is not likely that this bridge will be useable this season, hikers can still access the Paint Pots and the Ochre Creek trail via Marble Canyon (see “Paint Pots and Rockwall Trail detour in Kootenay National Park”). Meanwhile in Banff National Park, bridge repairs are underway on the Goat Creek trail (14) near Banff. The bridge over the Spray River at the 9-km mark on this popular trail should be back in place in time for the winter season. Another bridge at 6.4 km on the Cascade Fire Road (77) is scheduled to be replaced this fall. In the meantime, backpackers using this route will have to ford the Cascade River (usually a reasonable crossing in late August and September). 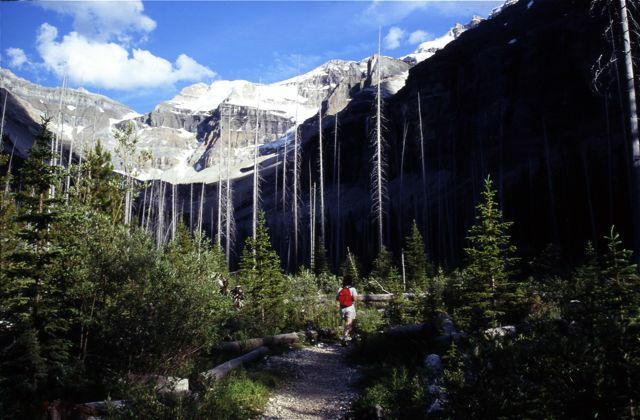 Trail numbers in parentheses are referenced to the Canadian Rockies Trail Guide.